The first five-year cumulative revenue (2017-2021) is projected to be US$ 42,081.6 Mn, which is expected to increase rather significantly over the latter part of the five-year forecast period. 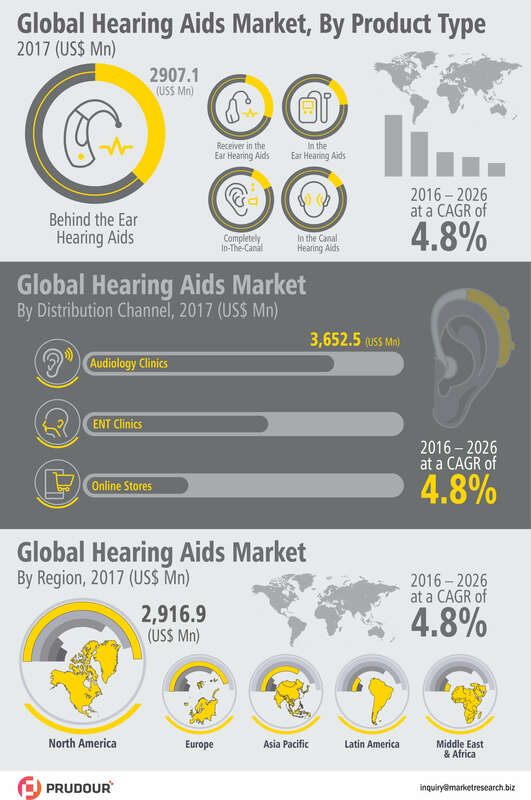 According to report, the hearing aids market is projected to reach a value of over US$ 11,747.0 Mn in 2026 at a CAGR of 4.8% over the forecast period. By product type: The behind the ear hearing aids segment accounted for highest revenue share contribution as compared to that of the other product type segment. By technology: The digital hearing aid segment is accounted for highest revenue share contribution in 2016, and is expected to register the highest CAGR of over 4.0% over the forecast period (2016-2026). By distribution channel: The online stores segment is estimated to register highest CAGR of 5.1% as compared to that of the other distribution channel segments. By region: The market in North America accounted for highest revenue share in the global hearing aids market in 2016, and is expected to register a CAGR of over 4.0% between 2017 and 2026.